The Woolly Brew: She's done it again! In super fast time Tracy has wowed us with this beautiful cardigan knitted in Rico Baby DK, shade Ecru. 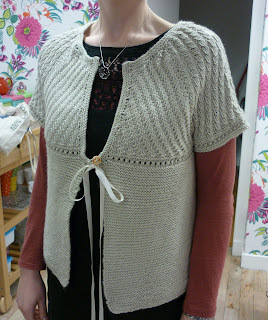 You can find this pattern for Juliet in our Debbie Bliss Rialto Book. Who said knitting was slow! Wonder what Tracy will tackle next.